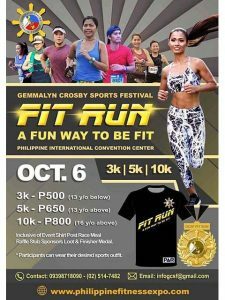 Fit Run Opens 5th Crosby Sports Fest at the Philippine International Convention Center | JustRunLah! 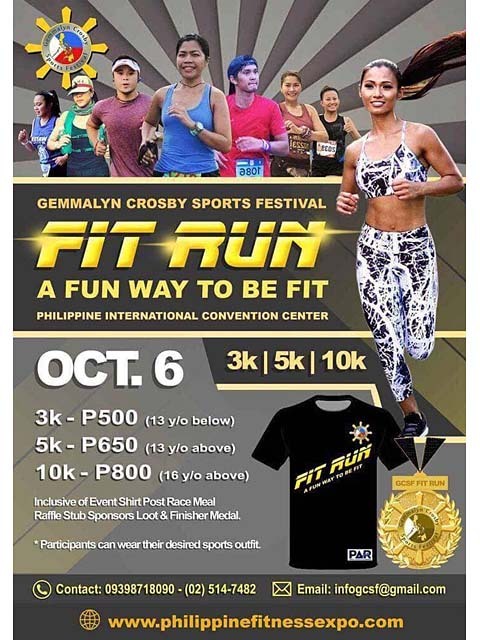 THE FIFTH edition of the Gemmalyn Crosby Sports Festival will be held this October 6 and 7 at the Philippine International Convention Center. 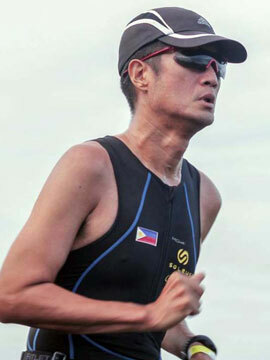 The gathering will be kicked off by the very first “Fit Run” on Saturday wherein the running public will be joined by Crosby and several famous athletes and personalities from the sporting world. Distance categories will be 10 kilometers for those aged 16 years and above while the five and three-kilometer categories will be open to those aged 13 years and above. Registration fee is set at PHP 800.00 for 10 kilometers, PHP 650.00 for five kilometers and PHP 500.00 for three kilometers inclusive of a race shirt plus a medal, raffle stub and loot bag from sponsors upon crossing the finish line. Just visit the “Gemmalyn Crosby Sports Festival” Facebook page to register and to get more information. Aside from the Fit Run, there will also be competitions or demonstrations in other popular sports like Basketball, Bodybuilding, Dance Sport, Zumba, Boxing, Fencing, Muay Thai, Wrestling, Karate-Do, Brazilian Jujitsu, Taekwondo, Mixed Martial Arts and Arnis. The latest products and services in the field of sports, wellness and nutrition will also be on exhibit over the two days. There will also be seminars and workshops on various sporting topics. Crosby is a competitive bodybuilder and fitness contestant who has represented in the country in several international competitions and is the first Filipino to be given an International Federation of Bodybuilding and Fitness (IFBB) Pro Card. The GCSF is made possible with the help of the Philippine Sports Commission (PSC).